We had a fun-filled weekend! Did you? Our Halloween festivities kicked off Friday night with a family pumpkin carving party. For treats, we enjoyed our yummy spider web snacks that we had made earlier that day. Then we roasted 3 different flavors of pumpkin seeds–one batch using this yummy recipe for maple spice seeds. 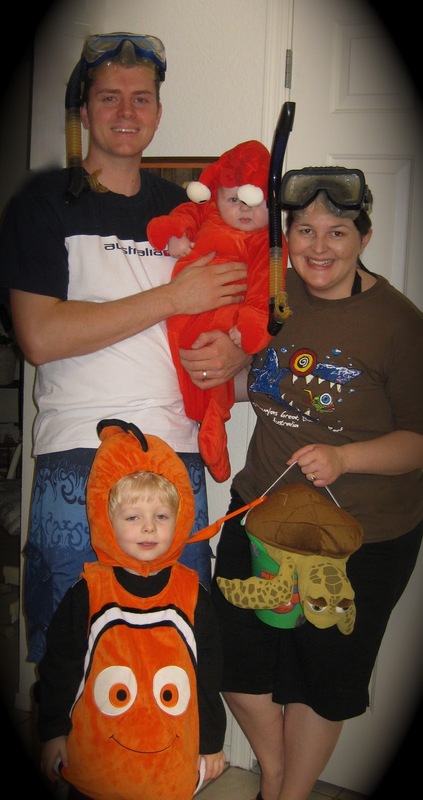 For Halloween, we enjoyed doing a family-theme once again. And, true to form thus far, we stuck with a theme involving animals! I may be just slightly biased, but I happen to think these two are the cutest underwater creatures two snorkelers could find! Now, on to all things Thanksgiving! Happy November! I love those baby cheeks! How sweet! Thanks for linking up your costumes! I love the family theme idea. One of these days… Have a great weekend!